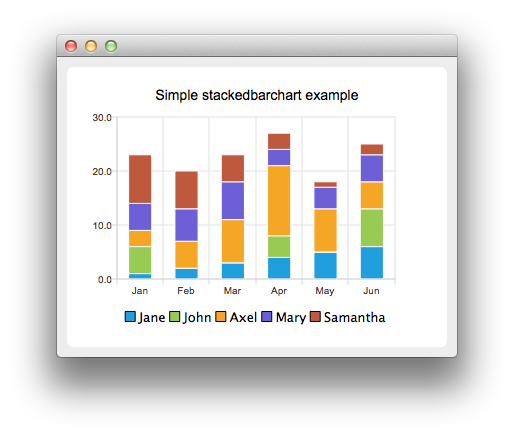 The QStackedBarSeries class presents a series of data as vertically stacked bars, with one bar per category. Each bar set added to the series contributes a single segment to each stacked bar. See the stacked bar chart example to learn how to create a stacked bar chart. See also QBarSet, QPercentBarSeries, and QAbstractBarSeries. Constructs an empty bar series that is a QObject and a child of parent. Removes the bar series from the chart. Returns the stacked bar series.